If you want to combine camping with volunteer work, consider a volunteer vacation with the American Hiking Society. 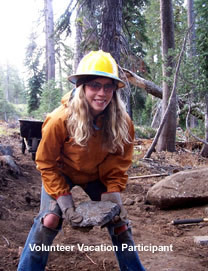 The volunteer vacations are a week long, and combine camping with building and maintaining trails in various parts of the United States. Participants can choose the type of volunteer vacation that is right for them based on what state they would like to volunteer in, how challenging they would like the work to be, the type of accommodations they prefer, the age range of the participants, and what month and year they would like to go. Currently, volunteer vacations are available in 25 states some of which are Alaska, Washington, Texas, Florida, Maine, and Colorado, and also in the U.S. Virgin Islands. The difficulty level of the vacations range from easy to very strenuous. Accommodations vary from primitive tenting, improved tenting, shelter, and cabin. Plus there are volunteer vacations that are suitable for families, for people ages 18-21, and for people 21 and over. For example, there are currently two open projects in the US Virgin Islands Nation Park in November 2008. The work being done is restoration of historic trails, with the work being moderate to difficult. Participants will be driven to a trailhead work site each morning and will have to hike up to an hour to their work site. Four to six hours will be spent working on the trail. Participants will be able to spend their non working hours enjoying the beaches, water activities, or touring historic ruins. The cost of the trip is $245 for American Hiking Society Members or $275 for non-members. There are additional costs for food and lodging. Another volunteer vacation that is currently accepting volunteers is at Crowleys Ridge State Park in Arkansas from November 2-8, 2008. The work level is easy to moderate and work may consist of bridge repair, erosion control, constructing an interpretive trail, signage, tread work, or clearing work. For more information on the opportunity in Arkansas, click here. To check out all the opportunities, click here for an interactive map and for more information on what to expect when taking a volunteer vacation. To learn more about the American Hiking Society, who organizes the volunteer vacations, click here.